A file picture of Dan Martin in action at the Rio Olympics. FRENCHMAN JULIAN ALAPHILIPPE claimed a dominant victory on the fourth stage of the Paris-Nice race today and seized the overall lead in style at the halfway point of the race. 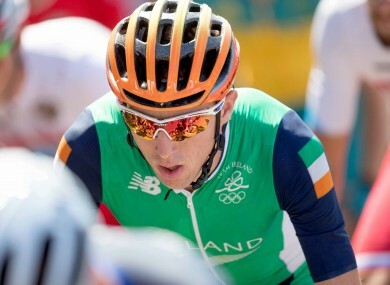 The Quick Step rider, a team-mate of Ireland’s Dan Martin, finished 19 seconds ahead of Spain’s Alberto Contador at Mont Brouilly, near Lyon, in the 14.5km time-trial that began in Beaujeu and ended with a 3km climb over the vineyards of the Beaujolais. Tony Gallopin came third on the day and is up to second in the overall standings, 33 seconds behind Alaphilippe. Contador is now 1min 31sec off the pace in eighth. Alaphilippe’s win was the second for a Frenchman since the race began on Sunday. The 24-year-old, who came fourth in the Rio Olympics road race last year, had never previously won a major time-trial. Martin finished 13th in today’s stage, 63 seconds behind Alaphilippe and moves up four places to fifth position overall, 1.20 behind the Frenchman. Sam Bennett, 24 hours after securing an historic stage win, was 4.18 off today’s pace in 155th spot out of the 166 riders and drops to 26th overall. Nicolas Roche recorded a 55th-place finish today, 1.53 behind Alaphilippe, and sits in 46th in the general classification. Philip Deighan was back in 105th spot today and is now in 125th spot overall. “It really was the type of stage that suited me, with a quick first part made more technical by the rain and then the climb,” Alaphilippe said. Two-time Paris-Nice winner Richie Porte of Australia was the quickest rider up the Mont Brouilly climb but finished 10th on the stage, 50 seconds behind the winner. Tomorrow’s fifth stage will take the peloton 199.5km from Quincie-en-Beaujolais to Bourg-de-Peage. 1. Julian Alaphilippe (FRA/ETI) 14.5 km in 21min 39sec (average: 40.2 km/h), 2. Alberto Contador (ESP/TRE) at 0:19, 3. Gorka Izagirre (ESP/MOV) 0:20, 4. Tony Gallopin (FRA/LOT) same time, 5. Ilnur Zakarin (RUS/KAT) 0:33, 6. David De la Cruz (ESP/ETI) 0:45, 7. Michael Matthews (AUS/GIA) 0:47, 8. Sergio Henao (COL/SKY) 0:48, 9. Jon Izagirre (ESP/TBM) 0:49, 10. Richie Porte (AUS/BMC) 0:50. Other: 13. Daniel Martin (IRE/ETI), 55. Nicolas Roche (IRE/BMC) 1:53, 105. Philip Deighan (IRE/SKY) 2.53, 155. Sam Bennett (IRE/BORA). 1. Julian Alaphilippe (FRA/ETI) 12h36:27, 2. Tony Gallopin (FRA/LOT) at 0:33, 3. Gorka Izagirre (ESP/MOV) 0:47, 4. Sergio Henao (COL/SKY) 1:05, 5. Daniel Martin (IRL/ETI) 1:20, 6. Philippe Gilbert (BEL/ETI) 1:24, 7. Ilnur Zakarin (RUS/KAT) 1:28, 8. Alberto Contador (ESP/TRE) 1:31, 9. Rudy Molard (FRA/FDJ) 1:32, 10. Arnaud Démare (FRA/FDJ) 1:35. Other: 26. Sam Bennett (IRE/BORA), 46. Nicolas Roche (IRE/BMC), 125. Philip Deighan (IRE/SKY). Email “French celebrate dominant stage win as Martin moves up to fifth in Paris-Nice standings ”. Feedback on “French celebrate dominant stage win as Martin moves up to fifth in Paris-Nice standings ”.